About 25 years or so ago, the USDA in Miami was sent a number of avocados from Israel, They are now planted on the ground, Looks like Israel send their breeding stock to the US to have a "backup" protection. But no one is sure. Back then the records were not computerized so there is very little information. It least that is what I have been told. You can see all the information that the USDA has here: http://www.ars-grin.gov/cgi-bin/npgs/acc/display.pl?1471. I have emailed the Volcani Center in Israel but no reply. Then I contacted a Tropical Fruit Forum member in the Canary Island and he did came up with this information. A lot of Canary Island resident emigrated to Cuba and Venezuela in 18 and 19 Century, when they came back to their home land they brought back avocado seeds and planted them. 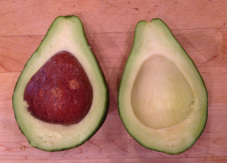 This was the case of this variety, it was located in the grove owned by Arguineguin, (thus the name) known to have a good variety of West Indies Avocados. In the 1980 Israelis from the Volcani Center came to the Canary island looking for root stock resistant to salinity. They were hoping that the west indies material in the Canary Island was purer than the one form the Americas because of so much inter breeding. They collected some samples, this was one of them. I'm not sure why they still have it in their germplasm collection perhaps they have found some good attributes. Eventually Arguineguin's grove was decimated and a lot of trees were cut. The Canary Island Agricultural Research Center is undertaking and effort to recover all the lost varieties. In 2010 they brought back bud wood of the Argui 1 and others and are growing them to preserve this heritage..
January 17,2014: All grafts took well and the tree is growing very fast. See Pictures. February 14, 2014: What a difference 30 days make. The tree is on its way to be a very large tree in a year. See Pictures. December 12, 2014: Seems like this is going to be an early flowering tree, It is building flower buds now. January 30, 2015: The Arqui 1 is in bloom some flowers are opening in the last two days the one s I have seen look like male flowers in the morning but we are having temperatures at night on the 50's and that play trick on the flowering specially of WI race. February 1, 2015: Seems like the Arqui 1 is B type, male flowers clearly open by 9 am. This tree is huge for 15 months post top work. Likes it where is at. May 16, 2015: The tree set some fruit, not a lot for its size. This winter was a bit different thus a lot of issues with different trees. I went to the USDA in Miami and there was fruit falling off the tree the third week in May. The fruit I see in the tree needs several weeks. Can be because the USDA location is a lot warmer than my grove. So far the fruit is clean. See pix..